The challenge I had in my last job was where I stored all the information (e.g. 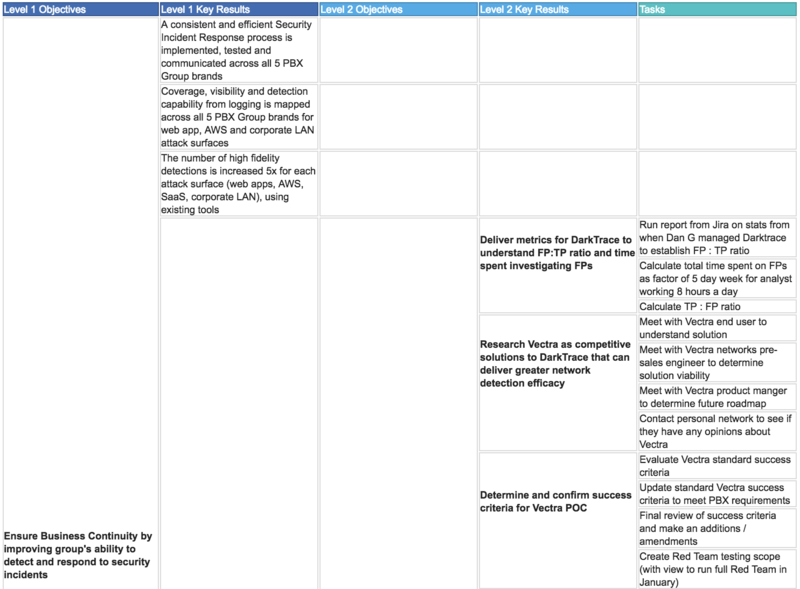 tasks, objectives, outcomes) about the critical path I’d come up with. It was either in my head, in a notepad, or somewhere online. The good thing was that I was only really dealing with one project (albeit one with lots of strands across lots of business units), so I could just about get away with it. At Photobox, the good news is our excessive use of Jira means that we have somewhere to store all the information we can dream of generating, but I have far more areas to think about and vizualizing everything together across all the areas of work is not easy. 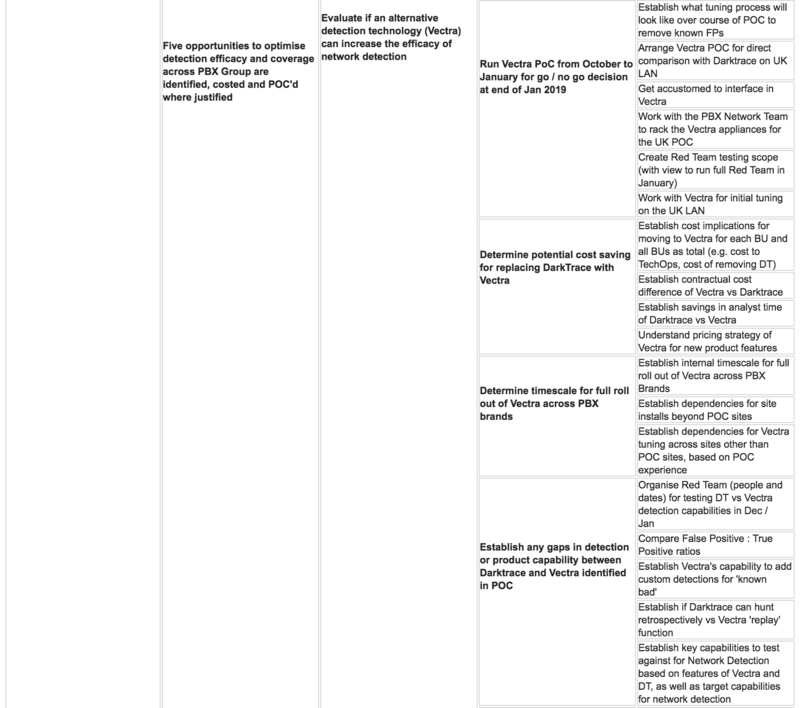 So I decided last week to focus on the single activity of getting everything into Jira, in a structure I could use to communicate what I’m up to with our execs and across our team, and use to review our critical path every week during our sprint (aka: continue to run as fast as you can forever ho ho) planning session. This started with ‘the goal’ that I’d been set as part of our OKR framework. This is still developing, but roughly I think about it like this. The top level Objective for the Detect team is ‘Ensure business continuity by improving the Group’s ability to detect and respond to incidents’. Lofty, I hear you say. Indeed so. Thus one must break it break it down. 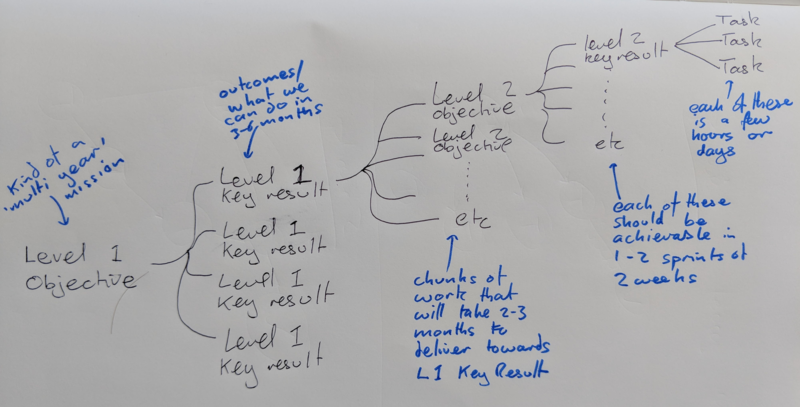 Here’s an example of this structure for one of our Level 1 Key Results. It’s in table format as I haven’t quite got the ’tree visualisation’ that looks like the picture above working yet. There are several benefits of having this mapping. First is to help us develop process playbooks; in this case, for running POCs of detection technologies on our LAN. The second (which the table structure doesn’t show) is to be able to see the order of tasks (Jira doesn’t do this either, so we have a way to show this in the tickets as organisation is done in a Kanban board until we sort our preferred vizualization). And finally we can visualise all our OKRs across the entire structure above, so that not only do we know what we’re all doing across the team, but we can also share and review our thinking to get challenge on whether we doing the right things, and whether the tasks we’ve mapped follow the critical path (the longest string of dependent, non-compressible tasks) to our outcome.